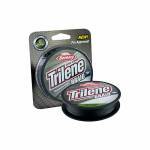 Berkley Trilene 100% Fluorocarbon Leader Material Fishing Line - Clear Leader Spool 100% Fluorocarbon leader material. Ultimate invisibility - Similar refractive index as water so fish can't see it. Ultimate Impact Strength - Proprietary 100% PVDF formula specially processed for the ultimate in impact strength. 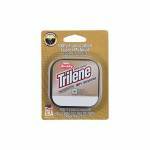 ..
Berkley Trilene 100% Fluorocarbon Professional Grade Fishing Line. Professional grade formula provides incredible shock strength, abrasion resistance and knot strength. 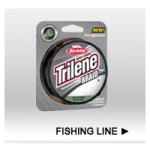 Fast sinking with greater line density for high sensitivity and less bow in the water. Ultimate invisibility - line has similar refractive index to water. Assorted break strengths available. 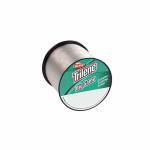 ..
Berkley Trilene Big Game Monofilament Fishing Line - 1/4 Spool. Extreme fighting power for big game fish - freshwater or saltwater. Super strong - Incredible strength for confidence and control. Shock resistant - Controlled stretch adds fighting power. Extra tough and abrasion resistant - Tough against rough or sharp objects. 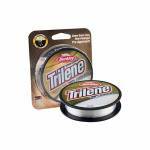 ..
Berkley Trilene Braid Professional Grade Fishing Line. Eight-carrier, high pick count Dyneema radial braided line is ultra round and smooth. Assorted break strengths available. ..
J-Braid 4X a 4 Carrier has been added, J-BRAID 4X perfect for abrasion resistance and ease of use for knot tying and line management. The NEW 4 Carrier lends itself to be a bit thinner diameter great for additional line on your reel when necessary. 4X is made with the highest quality Dyneema material available on today’s market. Dark Green that is more natural in situations where you may want to tie your hook or lure directly onto the onto the line–without a leader. 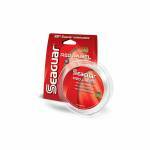 ..
A virtually invisible fluorocarbon line that is 40% softer than the leading brand. Soft, Subtle and Castable. 12lb Test .011in diameter 200 Yards ..
A virtually invisible fluorocarbon line that is 40% softer than the leading brand. Soft, Subtle and Castable. 15lb Test .013in diameter 200 Yards ..
A virtually invisible fluorocarbon line that is 40% softer than the leading brand. Soft, Subtle and Castable. 17lb Test .015in diameter 200 Yards ..
A virtually invisible fluorocarbon line that is 40% softer than the leading brand. Soft, Subtle and Castable. 20lb Test .016in diameter 200 Yards ..
A virtually invisible fluorocarbon line that is 40% softer than the leading brand. Soft, Subtle and Castable. 25lb Test .017in diameter 200 Yards .. This freshwater main line offers the knot and tensile strength that is 30% stronger than the competiton. The nearly invisible performance of 100% fluorocarbon comes in an economical option everyone can appreciate. 12lb Test .011in diameter 200 Yards .. This freshwater main line offers the knot and tensile strength that is 30% stronger than the competiton. The nearly invisible performance of 100% fluorocarbon comes in an economical option everyone can appreciate. 15lb Test .013in diameter 200 Yards .. 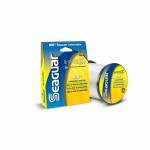 This freshwater main line offers the knot and tensile strength that is 30% stronger than the competiton. The nearly invisible performance of 100% fluorocarbon comes in an economical option everyone can appreciate. 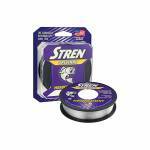 20lb Test .016in diameter 200 Yards ..
Stren Original Monofilament Fishing Line - Clear Filler Spool. Casts effortlessly, ties a great knot and offers the perfect balance of strength, sensitivity, suppleness and abrasion resistance to give fresh and saltwater anglers the advantage in any fishing situation. UV GUARD extends the lifetime of your line Superior knot and tensile strength to land big fish Tough and abrasion resistant Low memory for easy casting and handling .. 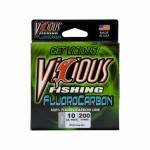 Vicious Fishing 100% Fluorocarbon Clear Fishing Line. Virtually invisible under water and sensitive enough to detect even the slightest bites. Assorted break strengths available. 250yd spool. High tensile strength Abrasion resistant Low stretch .. 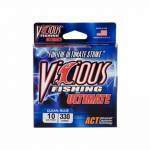 Vicious Fishing Clear Blue Ultimate Fishing Line. Advanced Copolymer Technology (ACT) allows this line to handle the most vicious of strikes every time. Assorted break strengths available. Clear/Blue. 330yd spool. High tensile strength Very low stretch Greater knot strength Superior castability ..